This Quick Start deploys and configures a standardized architecture for the Center for Internet Security (CIS) AWS Foundations Benchmark. CIS Benchmarks are consensus-based configuration guidelines developed by experts in US government, business, industry, and academia to help organizations assess and improve security. This Quick Start implements the CIS AWS Foundations Benchmark, which is a set of security configuration best practices for hardening AWS accounts, and provides continuous monitoring capabilities for these security configurations. These industry-accepted best practices provide AWS users with clear, step-by-step implementation and assessment procedures. The goal of this Quick Start is to make the implementation of core AWS security measures straightforward for security teams and AWS account owners. The Quick Start supports the benchmark by creating AWS Config rules, Amazon CloudWatch alarms, and CloudWatch Events rules in your AWS account. The deployment is automated by customizable AWS CloudFormation templates and scripts that build and configure the environment in about 10 minutes. The Quick Start also includes a security controls matrix (Microsoft Excel spreadsheet), which shows how the Quick Start components and configuration map to CIS controls. Watch this short video (8:31) to learn more about the CIS Benchmark Quick Start. by the Center for Internet Security (CIS). The Quick Start was built by Accenture in collaboration with AWS solutions architects and compliance experts, through the Accenture AWS Business Group. Accenture is an AWS Premier Consulting Partner. This Quick Start supports the AWS GovCloud (US) Region. AWS Config rules – Some of the CIS Benchmark controls are implemented as custom AWS Config rules, which are backed by an AWS Lambda function, and AWS managed rules. To review these controls and their implementations, see the security controls matrix. CloudWatch alarms – Continuous monitoring for some of the CIS controls is implemented using a combination of CloudWatch alarms and custom log metric filters. To review these controls and their implementations, see the security controls matrix. CloudWatch Events – Continuous monitoring for some of the CIS controls is implemented using CloudWatch Events rules. To review these controls and their implementations, see the security controls matrix. 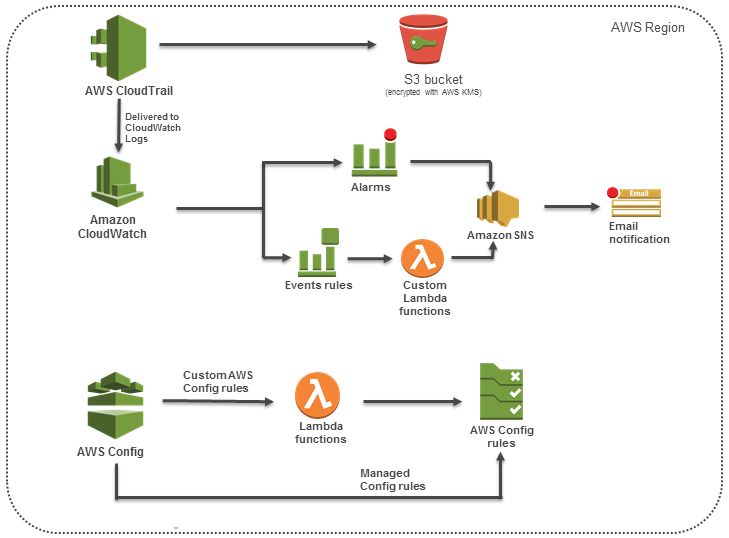 Lambda functions – All custom AWS Config and CloudWatch Events rules are backed by Lambda functions that implement the relevant CIS security control, and either report compliance status or notify the end user of a security configuration change. AWS CloudTrail – The CloudWatch Events rules and alarms depend on CloudTrail for change tracking and reporting continuous compliance. The Quick Start provides an option for configuring CloudTrail. The Quick Start also includes a pre-condition check to verify if CloudTrail is configured in your AWS account before it implements the security configurations for all the CIS controls. AWS Config – Both the custom AWS Config rules and AWS managed rules depend on the AWS Config service to be configured. The Quick Start provides an option for configuring AWS Config. The Quick Start also includes a pre-condition check to verify if AWS Config is configured in your AWS account before it implements the security configurations for all the CIS controls. Sign in to your AWS account at https://aws.amazon.com. Confirm your subscription to email notifications for security configuration changes. Test your deployment by viewing the resources that were created by the Quick Start.